I am planning (ha ha, you will see why I laugh at the term as this blog progresses) a trip, in a wheelchair, from Exmouth to Plymouth. Titles matter, so Mouth to Mouth, or One Wheelchair, No Fridge are fighting it out. Journeys are central to so many radical changes. Israelites famously moved at slightly less than snail’s pace to find the one bit of the Middle East that didn’t have oil. Fidel, Che and Raul embarked with 79 others on a totally unsuitable craft, and after losing 60 of their number, still brought down the Batista regime. Mao’s long march, pilgrimages in the names of every God and none, are central to new ideas. This journey has distinguished antecedents, none of which I have any intention of living up to. “One Wheelchair, No Fridge” or OWNF is a nod to Tony Hawk’s famous work, which I have never read, despite it sitting at the top of my mental hit list for years. Having decided to travel in competition I want to avoid the accusations of producing a bad copy. By continuing to not read Tony Hawks I can at least avoid half the problems. It may be bad, but it won’t be a copy of “Round Ireland with a Fridge”. Mouth to Mouth may describe this trip, but it will massively limit any future trips as place names ending in Mouth, at both ends of a trip I want do, are in short supply. Hadrian’s Wall, which is on the list, is great from Tynemouth, but there isn’t a mouth at the other end. (No jokes, please). 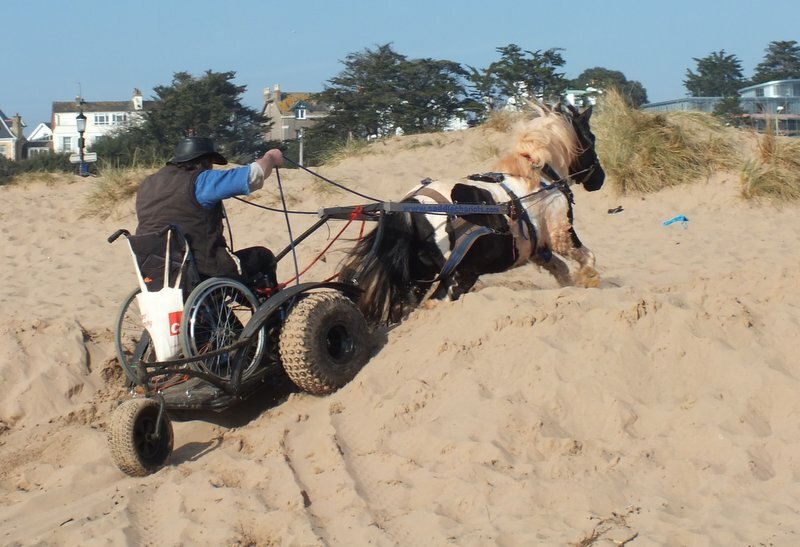 Over the last 15 years I have developed an all terrain wheelchair access system, Pony Access. OWNF is a very personal celebration of that work. 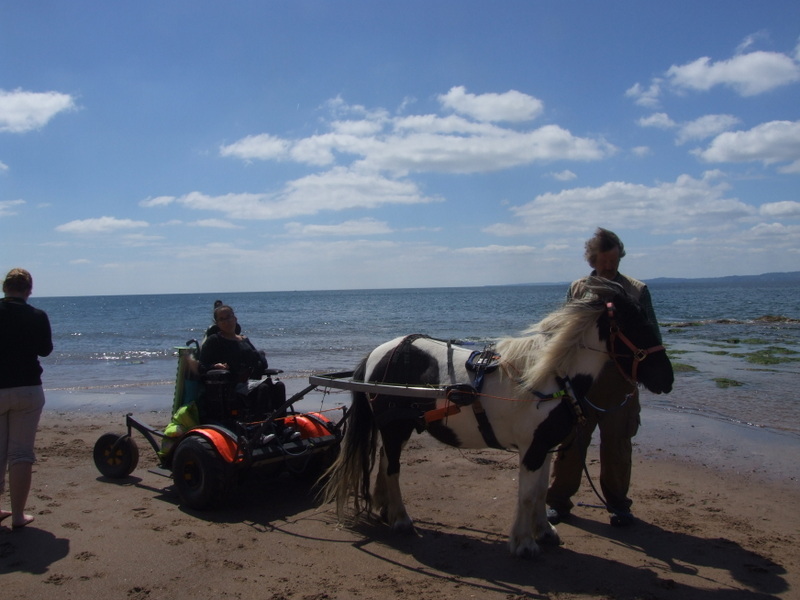 I hope it will show others that all terrain wheelchair access is a reality, as I drive, in a wheelchair from the beaches of Exmouth, along the mudflats to Lympstone, over Woodbury Common and by road to Exeter. From there I will climb Haldon Hill to the remains of the illegal Traveller Site where I lived, and was supported and encouraged, as I made all terrain wheelchair possible. It is strange that those who are seen as least useful by society, have done the most to help me. Those with power and authority have consistently blocked and complicated my work, those at the bottom of the heap have encouraged, supported and helped. But that is the nature of revolution, those who have, don’t want to risk their possessions, their status or their skins. At the bottom of the heap, you have less to lose, at least less possessions and status, but the skin is just as sensitive, it bleeds and bruises just as easily, it just doesn’t seem to matter as much to polite society. Back to One Wheelchair, No Fridge. From Haldon, I will head to Steps Bridge and along the beautiful River Teign, past Fingle’s Bridge to Castle Drogo. Then up to Dartmoor. 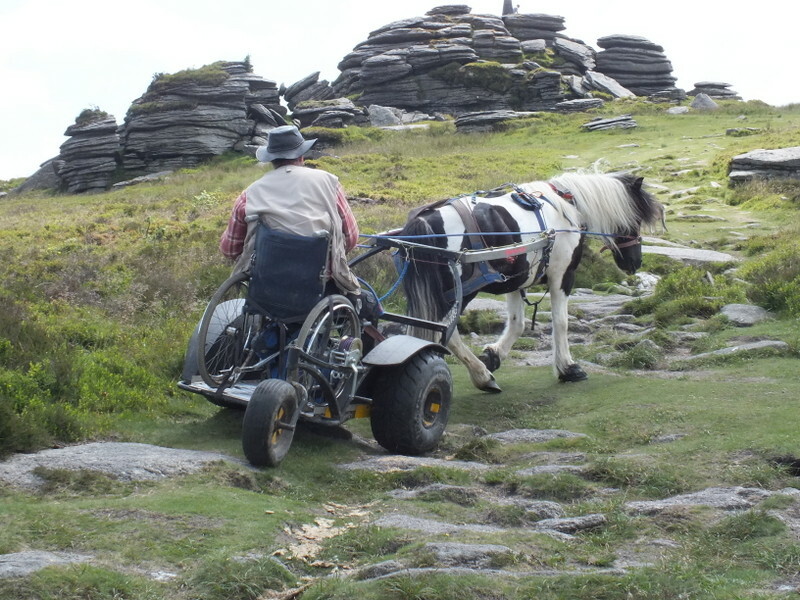 I have driven wheelchairs across large chunks of Dartmoor, Rowtor, Yes Tor, West Mill Tor, Belstone, Bellever Tor, Merivale Stone Rows, Great Mis Tor, Hound Tor and the mediaeval village, even the clay pits near Shaugh Prior. This trip will be to find new bits but I will certainly travel from Dartmoor Prison to Butterdon Hill and Ivybridge. 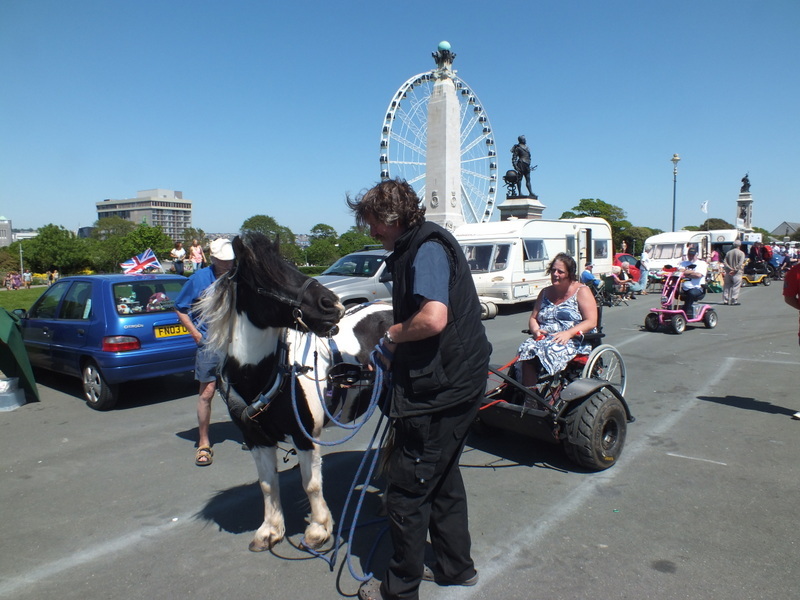 From there, traffic is the limiting factor as pony drawn wheelchair enabled vehicles aren’t much fun on major dual carriageways over major river crossings. City centres are much better as Obama, my pony, loathes bridges, but is cool about most other places. So we will end up in Central Park, Plymouth. It was there or the Hoe, but Obama prefers the grass of Central Park to the concrete of the Plymouth Hoe. This journey isn’t to see if I can do it, I know I can. It isn’t even to prove I can do it. This video shows what I do. For better resolution pictures go direct to the BBC site which I can’t persuade to embed. http://www.bbc.co.uk/news/in-pictures-31939756 I am making the trip because travelling with a pony is the way to learn about ponies. I am sure Fidel and Che learned a load on the Granma, mostly about people, and next time, getting a more suitable boat. 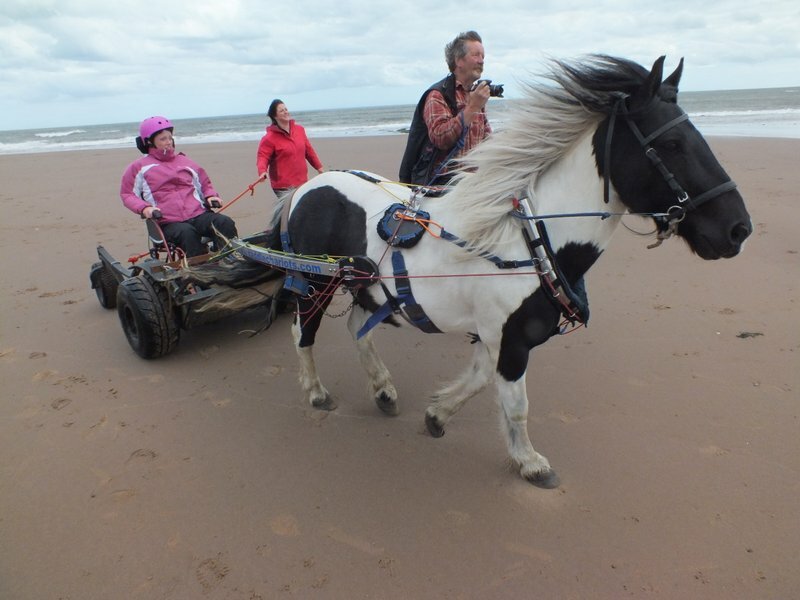 My work, providing all terrain wheelchair access has shown me new ways of working with ponies, and a long journey gives you the time to fully understand, and appreciate, the methods you are using, and the ways you could be working. I will be testing my joystick operated pony steering system system, in the only sensible way, on new terrain, and with no ability to predict the outcome. This entry was posted in Uncategorized and tagged disabled access, Eton, horse, Obama, pony, pony access, Riding for the Disabled, saddlechariot, traveller, wheelchair, wheelchair access. Bookmark the permalink.